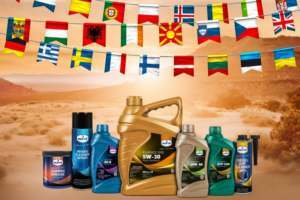 Eurol introduces two oil additives | Eurol B.V.
Eurol adds two new oil additives to the product range: Eurol Transmission Stop Leak and Eurol Hydraulic Tappet Valve. Eurol Transmission Stop Leak E802320 is developed to stop leaks in automatic transmissions. Eurol Transmission Stop Leak contains no solvents, allows seals and O-rings to swell and maintains them flexible. This additive is miscible with all mineral and synthetic ATF oils. Eurol Hydraulic Tappet Valve E802321 reduces the noise caused by the hydraulic tappets. This oil additive enhances the lubricating film between moving parts. Therefore, the movement is quieter making the car more comfortable to drive. The oil tubing is unclogged and the rattling noise coming from the valves, is reduced to a barely audible level. This introduction follows up on the proactive range policy of Eurol, which aims to fully support dealers and car repair shop holders. These two new oil additives adequately attend to increasingly occurring symptoms in practice. Both products are available in a user-friendly one-shot packaging of 250ml with clear instructions on application and use. Both products are available in the Eurol online additive advisor. This advisor simply translates (technical) symptoms to the best solution with corresponding product advice. The Eurol additive line includes fuel additives, engine and transmission oil additives and radiator additives. The additives have been developed by Eurol´s Research & Development department and extensively tested in practice. Eurol additives solve existing problems, but also have a preventive effect. The benefit and the necessity of using additives is growing. The percentage of bio-components in fuels is increasing, trips are shorter, engine technology more sophisticated and oil change intervals longer. Thus, the risk of engine contamination increases. Inferior engine performance, a bad start, higher consumption or extreme smoke development may occur. Eurol additives ensure a longer life of the engine, less wear, more engine power, lower repair costs, lower fuel and oil consumption and lower emissions.